At our My FootDr Currambine and West Perth podiatry clinics, our podiatrists provide the most effective nail care diagnosis and treatment – the Lunula cold laser fungal nail treatment. Our highly trained and experienced Podiatrists will give you the best treatment plan to treat fungal nail conditions. More than just giving your nails a cursory glance, we take time to examine their overall condition to find out the seriousness of the infection or any problem there is. We will discuss with you all our available treatment plans and help you choose the most appropriate one. Our treatments will not only improve your nail’s problem but also its overall appearance. WHAT IS A LASER TREATMENT AND WHAT IS SO SPECIAL ABOUT IT? The Lunula laser treatment is an innovation in toenail fungus treatment. At My FootDr Currambine and Perth, we use the Lunula Cold Laser treatment. It is a pain-free cold laser treatment that is proven safe and has no side effects. The laser is externally applied and requires no anesthesia. There is no requirement for any kind of medication as well as applying paint to your nails. The Lunula laser treatment uses two low-powered lasers to treat the infections within the nails, nail bed and surrounding skin. HOW DOES IT COMPARE TO THERMAL LASERS? Although thermal or hot lasers are widely used in other podiatry clinics, the Lunula cold laser treatment can help with severe infections deep within the nail and nails that are very thick. The Lunula Fungal Nail Treatment is completed by our podiatrists who carry out the treatment including the preliminary diagnosis where your nails will be photographed and prepared. They will also explain the benefits of cold laser treatment and will give you self-management tips in taking care of your nails. IS FUNGAL NAIL LASER TREATMENT COVERED BY HEALTH INSURANCE? WHAT ARE THE SIGNS OF INFECTION FROM TOENAIL FUNGUS? Nails that are discoloured, thickened, damaged, and crumbly are clear signs of fungal infection. The presence of athlete’s foot is often associated to toenail fungus too. To be sure, visit your GP to detect if your nails are infected. For an accurate diagnosis, nail clippings can be taken from you to be cultured. Your social and sports activities together with your medical history, will all be considered as well. IS IT POSSIBLE FOR NAIL INFECTION TO RETURN? Yes. Nails or feet that are exposed to fungi can be infected again. At My FootDr, we also consider the post-treatment condition of our clients. We will give post-treatment management tips on how to free yourself from the possible return of the fungal infection. We advise patients to maintain proper hygiene and to always wear enclosed footwear in wet areas. We also offer a line of products that can be used to prevent the infection from coming back. The Lunula Cold Laser Treatment is 100% pain-free. There is no need for anaesthesia during the treatment. WILL THERE BE A RECOVERY PERIOD? There is no recovery period after the treatment. You can immediately go back to your normal everyday activities. CAN THE TREATMENT BE APPLIED TO FINGERNAILS AS WELL? Yes, the Lunula Cold Laser Treatment can be done on fingernails with fungal infection with similar results. Consultation takes around 30 minutes and if required, treatment will be done at the appointment. WHEN WILL I START WITH THE LASER TREATMENT? You are not required to undergo the treatment unless our Podiatrist finds it beneficial for you. In such case, you have the option to do the treatment immediately after the consultation or have it on another scheduled appointment. WHAT ELSE SHOULD I KNOW ABOUT THE LUNULA LOW-LEVEL COLD LASER TREATMENT? The Lunula Cold Laser is a 100% pain-free laser that is safe and has no side effects. 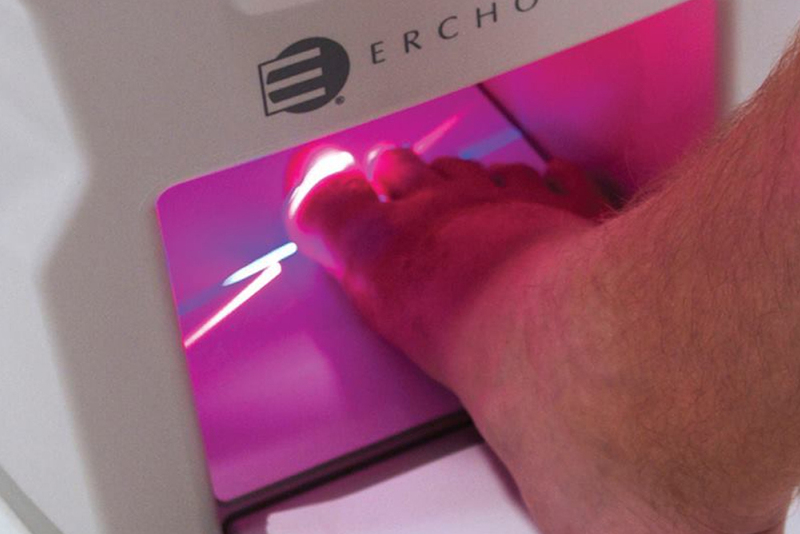 This laser system is computer controlled to rotate evenly using the combination of two low-powered lasers on the nails, nailbeds, and surrounding skin. A blue laser beam acts directly upon the fungal cells to weaken them, and a red laser beam affects the body’s natural immune system to strengthen it. Four treatments (each only 12-minutes long) are recommended on a one treatment per week basis though this may still vary depending on how serious the infection is. Please bring along a clean pair of socks to wear following the treatment. We will sterilise one pair of shoes at the consultation, other pairs can be sterilised in our machine. Please bring these along with you. No nail polish should be worn. Are you the one in ten Australians who has a fungal nail infection (onychomycosis)? Don't be embarrassed. Treat nail fungus with the Lunula Cold Laser. The latest in cold laser technology, this service is a painless, fast and highly effective treatment for fungal nail infections. Onychomycosis is a word that has probably never been used in your household before. As the medical name for fungal nail infections, it might also not be something that gathers much airtime at the family dinner table either. However, while some people may feel embarrassed revealing such a foot condition, there really is nothing taboo about talking about toenails.